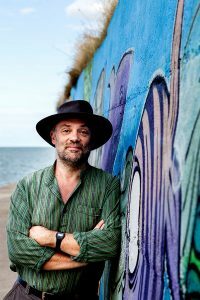 Today I’m delighted to be handing over my blog to a fellow Devon based writer, Richard Dee. Why not go and grab a cuppa, and then come and get acquainted? Hello everyone and my thanks to Jenny for the spot today. Let me introduce myself. I’m Richard Dee and I write mainly Science Fiction and Steampunk style stories. If that means space shenanigans, fantastic planets, and Queen Victoria on steroids to you, well that’s a pretty fair guide to some of what I do. If you don’t know what I mean, just take a look at the covers. And before you double take, yes that is a medieval helmet in one of the pictures. I was actually asked to do a story for the 1066 Turned Upside Down project by the wonderful Helen Hollick. 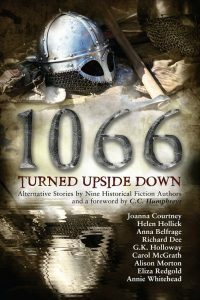 For those who don’t know about 1066 TUD, it’s a collection of short stories offering an alternative take on the events surrounding the Battle of Hastings and what might have been. For my contribution, I chose to write about the butterfly effect and… well, you’ll just have to read it to find out. The book contains eleven stories from nine authors. I did wonder if Sci-fi was a good fit for historical fiction but judging by these review comments that I found; I seem to have fitted in nicely. To be honest, I’ve never really liked the idea of genres and stereotypes. When it comes right down to it, it’s all fiction and as well as the science mine all contain elements of every other genre, history, crime, war, fantasy and even a little romance. In fact, they’re populated by ordinary people; they have the same emotions and the same motivation as we all do as they go about the tasks I’ve set them. The universes that they inhabit may be strange to us, but they’re natural to them. Science fiction is such a broad platform; mine is just as concerned with the triumphs of people as it is with the wonders of the science. To me, the science is just another character, it can have emotion and a voice, in the same way that any person or setting can. I hope that my stories work as stories and not just as “sci-fi.” That might make you wonder why I chose sci-fi as a vehicle for them. And the answer might not be what you would think. 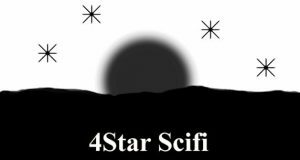 When I first started writing, I thought that sci-fi would be easy to write, after all; how could you research the future? I could just drop my plot and characters into the future somewhere – easy! And that was mistake number one! I’m sure I do at least as much research as everyone else, just to make sure that all my settings have a basis in fact. And that at least part of it sounds true, or at least sounds possible based on what we know today. The consequence of that is that on the way I’ve made up more back stories than I could shake a stick at. 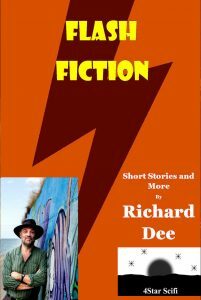 They form the basis of my Short story collection Flash Fiction and have given me short stories in abundance, enough for Flash Fiction 2 in fact. And the more novels I write, the more back stories I need. As well as the usual creation of worlds, spaceships and technology; I’ve invented the inventor of faster-than-light travel and told everyone how he did it (The tale of Christopher Padgett), explored the dichotomy of time dilation (Tales from the Sleepers), and wondered how the future will see history (Looking back at our Future). I even invented a magazine to print the articles of future history that form the backdrop to my adventures (Galactographic!). And in the new collection will be farming in Space (The Orbital Livestock Company), The Grandfather paradox (It works both ways), and much more, including several Steampunk vignettes from my world of Norlandia. And now that I’ve invented these things, I can use them in all my universes. Nothing is ever wasted, and crossovers abound. And thanks to my loyal readers, what were originally intended to be stand-alone stories are becoming series. My debut novel, Freefall, is a tale of loss, loneliness and the biggest story ever kept from us by an authoritarian government. 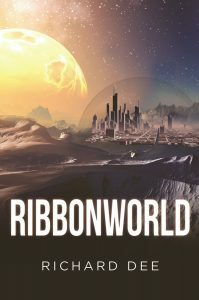 The second, Ribbonworld, features corporate espionage and conspiracy set on a planet that we have no right to exist on. 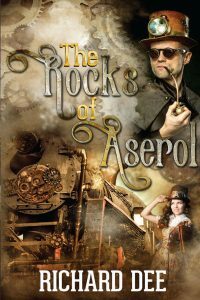 The third, The Rocks of Aserol, takes place in an alternative Victorian society where oil and electricity have never had a chance to shape the lives of the inhabitants. Incidentally, until I started this one, I never realised what you could make of a world without the things we all take for granted. Never mind warp drive and photon torpedoes, in the Steampunk universe; the possibilities are as endless as they are ten thousand years from now! 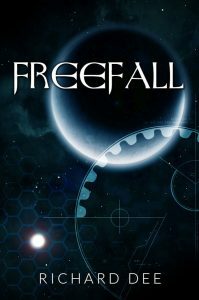 And thanks to my readers Freefall now has a prequel. 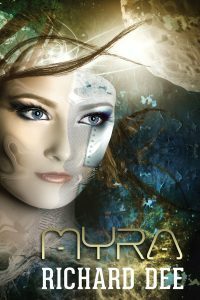 Myra will be published in about six weeks. And I’ve got enough ideas for a third story in the series as well. Ribbonworld has a sequel called Jungle Green, which is destined to see the light of day soon and The Rocks of Aserol has a sequel in development. All these are the direct result of feedback. But they haven’t stopped me writing anything new. One of my short stories has spawned a book, featuring a new heroine. 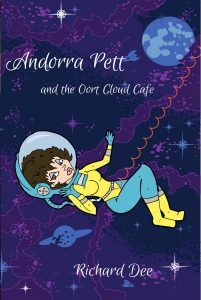 Andorra Pett first made her appearance in a short story last year in my collection Flash Fiction. After much encouragement, she is set for a full novel soon, it’s just about written, in the queue for editing and beta reading (if you’re interested, let me know), and the cover is done, now all I have to do is find the time to publish it. Going back to Myra, to give you a small taste of what’s to come, the story is titled for the heroine in Freefall. It was written to explain a remark our hero, Dave Travise, makes when he is continually reminded of the fact that Myra isn’t around anymore. Here’s the quote from Freefall. A lot of people asked me what the significance of that dent was; rather than keep explaining, I wrote a book as an explanation. If you want to know more about the dent, and what happened to cause it, Freefall is available now and Myra will be published on March 15th 2017 in all the usual places. But here’s a clue. Meet Dave Travise, at least that’s who his identity chip says he is. An ex-navy man on the run; somehow he’s ended up in a dead man’s shoes; on a new ship and on the wrong side of the law. With no way to prove his innocence, he’s just got to play along and keep his head down if he’s going to survive. As if he doesn’t have enough problems, now he’s fallen for Myra, the engineer on his new home. Pursued by criminal gangs and keeping one jump ahead of everyone, Dave and his new shipmates are going to need all the luck in the Galaxy just to stay alive. Myra tells the story of how Finn Douglas, Naval Officer; became Dave Travise, Galactic trader. And what happened before Freefall. So where does all this come from, where does a man who failed English at O level way back in 1974 get his motivation. For me, it all starts with a film I saw way back when I was an apprentice in the Merchant Navy. We were in New York in 1977 and the locals were all raving about a new film called Star Wars. I went to see it and it blew my mind. The technology was understated, it was greasy and it was prone to breaking down, that made it more believable to me than any shiny gadget from the future that I had seen before. This was the kind of future I wanted to write about, the kind where the hero’s in trouble and he pushes a button in the hope that something will actually happen. Where mankind has spread among the stars and bought all his Earthly vices with him. Or an alternative reality; where mighty machines powered by Steam and Clockwork drive a society that’s uneasy with the price of progress. There was a pause while life got in the way, I got married, got qualified (Master Mariner, BSc, First Class Thames Pilot) and survived (just) having three daughters. Writing was way down on my list. Then I retired and with the time to think, the creativity really started. And once I got started then the ideas flooded in and the work poured out. Freefall was published in 2013 (34 years after I had the first idea), Ribbonworld in 2015 and The Rocks of Aserol last year. I have three novels currently in the final stages of publication, Myra will come out in March 2017, as for the others; I’m not sure about them yet. And that brings me to the last part of my story, I self-publish. I own a publishing imprint, 4Star Scifi, and in that respect, I’m my own boss. I don’t set myself deadlines and I don’t take a percentage. What I have is control and a marvelous, hand-picked team behind me. Without my editor, my cover designer and everyone else, the person who formats my work, the beta readers, and my fiercest critic; my ideas would be just that. Of course, emotion is important in all my work, where would we be without it? Why would you mount a white charger if you didn’t want to rescue the maiden? Why would you caress a dent in the panel if you hadn’t loved and lost? My website says “Welcome to my Worlds,” but they aren’t just mine; they’re the worlds that I think we all want to inhabit. You can find me at www.richarddeescifi.co.uk, there’s all my news and lots of free content for you to enjoy, I try to post a new short story every month or so. You’ll also find details of my novels and works in progress. To finish up, here’s a quick Flash Fiction from my website, my thanks to Jenny for the platform and to you for making it this far. I hope you enjoy it. As I passed each room along the stone hallway I saw that they had all been ransacked, I grinned, that had been more enjoyment, a primeval feeling of exultation in destruction, part of all of us. Even though it was my stuff; my memories I had really let myself go. There were no neighbours to hear and I had made a lot of noise. By the time I had backed out of the porch and onto the gravel there was little of the liquid left in the bag. I squeezed the last of it out and took the bag to my car, putting it into the poly-box in the trunk. Now I just had to finish scene-setting. I went back upstairs and into the bedroom. I grabbed a towel from the en-suite bathroom and making sure I stood in the blood splashes I roughly wiped the blood on the floor. I made it look like a body had been dragged from the bed and bumped down the stairs. There was even the odd bloody footprint and I made sure that some smears made it onto the walls. It took a few minutes and the blood was starting to congeal by the time I had made it to the front door. Back outside I pulled off my shoes, the ones with the distinctive tread and bagged them next to the poly-box. There was a pair of trainers on the back seat and I hopped around while I put them on, gravel stuck to one sock and made me wince when I put weight on the foot, I sorted that out and took a last look around. My home for the past year looked serene in the early morning light, the door was ajar and the trail of red led inside. I glimpsed my face in the mirror as I settled into the driving seat, I was smiling, part one had been completed; I was dead and horribly so. I just had to dispose of a few things and part two could begin. I started the engine and drove away. Thanks for such a generous blog Richard! Fabulous stuff. Thank you for taking the time to put it together for us.